Maria and Tsugumi are cousins who have lived near each other for most of their childhood. Tsugumi’s parents own an inn in a coastal village. Maria’s mother helps out at the inn. Maria is a normal, good-natured girl. Tsugumi is a rude hellion who is afflicted by physical frailty. When Maria’s father finally gets a long-awaited divorce from his first wife, he brings Maria and her mother to Tokyo, where Maria will start college. When Maria learns that Tsugumi’s family plan to close the inn to move to the mountains, she returns to the coastal village for one last summer there. Though this book recommendation came from Fluttering Butterflies blog, I should also credit Eva from A Striped Armchair for the assist. I first heard of Banana Yoshimoto from Eva. Goodbye Tsugumi excellently captures the mood of summer, particularly summer nights. I think it’s a good book to read when it’s not summer, actually, because the book is written as a recollection. In these wintry months, I identify with the book’s ode to summer. I also identify with how Maria misses the ocean once she’s moved the city – how Maria and her mother stop in their tracks when a breeze carries the scent of the sea to Tokyo. And it is also a book that captures the feelings one may feel when a chapter of life is ending. Everyday life had never really made much of an impression on me before. I used to live here in this little fishing village. I would sleep and wake up, have meals. Sometimes I felt really great; other times I felt a little out of it. I watched TV, fell in love, went to classes at school, and at the end of every day I always came back here, to this same house. But when I let my thoughts wander back through the ordinariness of those cycles now, I find that somewhere along the way it has all acquired a touch of warmth – that I’ve been left with something silky and dry and warm, like clean sand. But I don’t want it to seem like the book is only mood and good writing. Though not a lot happens in the book, stuff does happen. Mostly, Tsugumi happens. The first line of the book is “It’s true: Tsugumi really was an unpleasant young woman.” She throws fits, laughs at others’ sentiment, and constantly calls everyone names. And yet, through Maria’s eyes, and also maybe through Tsugumi’s sheer force as a character, I came to like her, just as Maria did. During this last summer, Tsugumi falls in love with Kyoichi, whose parents are building a new fancy hotel in the village. This causes him trouble with others in town who see what this new hotel will do to the other inns’ business. Dogs are also a main part of this book. Maria sort of ‘bonds’ with Tsugumi while they walk a neighbor’s Akita named Pooch. They meet Kyoichi when Pooch riles up Kyoichi’s little Pomeranian, Gongoro. The book is kind of like Gongoro, the Pomeranian – it may not be a big book, but it has a lot of spirit and heart for its size. I will definitely be looking out for more books by this author. I haven’t read anything by Yoshimoto, but a friend recommends Kitchen, if you are looking for something else by her. Great review! Yoshimoto is a new discovery for me, too. Kitchen was a beautiful book and I heartily recommend it. Hope to read Goodbye Tsugumi soon. 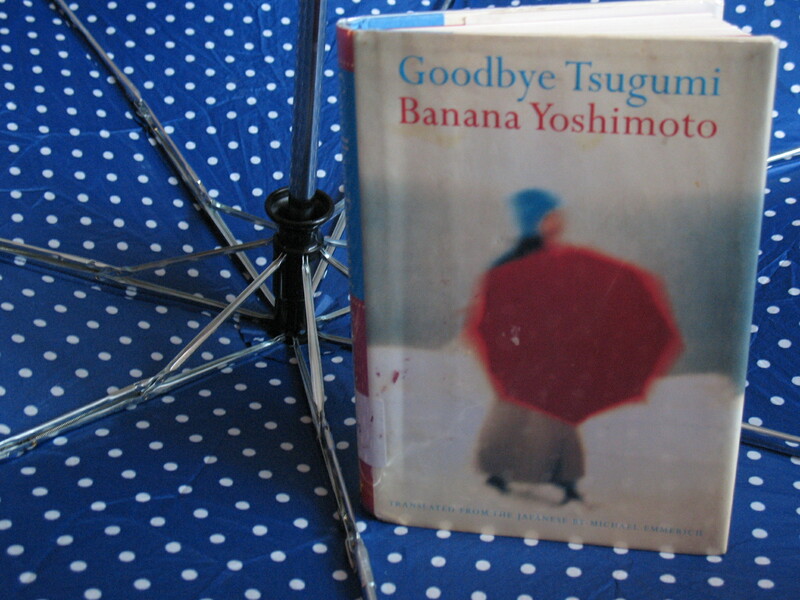 Banana Yoshimoto is one of my all-time favorite authors. Her books are all amazing, but I´d especially recommend reading Kitchen and N.P. Kitchen seems to be the overwhelming recommendation for this author – I will definitely have to check it out!